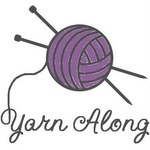 Joining Ginny’s Yarn Along from this Wednesday. I am briefly dipping into Catholic Home, particularly the Advent and Christmas section as I think through a few plans for both. This is such a nice reference to have- not too much information, but just enough ideas to help me as I think through our family’s preparation and celebration. My knitting came to an abrupt halt Monday as I took time to consider how I needed to alter a lace pattern to fit the cardigan. Many thanks go to a dear knitting friend who patiently humored me with debate over how to solve the problem. Most all I appreciated the giggles over why on earth I wouldn’t have just chosen a simple pattern. I’d tested out a few rows the week before but decided to rip back when I discovered a mistake. Now that a decision has been made about the lace, only one row of 124 stitches needs to be ripped out to start fresh with the new plan. I absolutely hate ripping back but from the start of this project I knew designing this cardigan as I go would mean I’d be doing a bit more of that than ususal. I dyed five skeins of worsted weight superwash wool for this sweater. One of the five skeins is noticeably darker than the other four so hopefully the cardigan will only require those four skeins to finish. The first skein lasted for the bodice and shoulders and the second was started at the begining of the lace. The recipient of the cardigan loves the variegated pink colors and softness of the wool. I suspect it will be awhile before it is finished to wear unless I have an unusual amount of downtime. This week was not a week for downtime and I nearly didn’t have the chance to do something for St Nicholas’ feast day yesterday. Our time at home in the morning was so brief that I waited to have the children discover what was waiting in their shoes until we came home for dinner. I hinted mysteriously on the drive home saying that I had noticed something strange that they should take a look at with me when we got home. There were squeals of surprise when we got home and they discovered chocolate goodies and coins. They were so excited about the treats that they initially missed the books waiting for them too. I had been able to stop at a used bookstore and found a paperback set of the Hobbit and the Lord of the Rings for the oldest and a nice hardbound Madeline book for the younger. Seven chapters of the Hobbit were devoured during school today and I suspect another couple before the little booklight was turned off at bedtime. I am sorely tempted to do a re-read with her, except for the fact that I’d never be able to put in the hours to keep up with the little speed reader. Happy reading and knitting friends! This entry was posted in Books, Hand Dyed Yarn, Knitting, Yarn Along by Sarah. Bookmark the permalink.